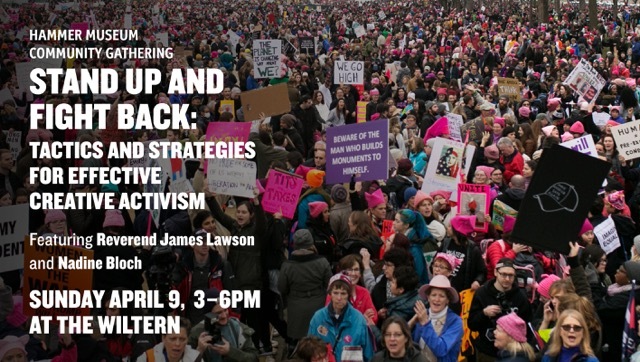 The training organization I’ve been repping for 5+ years – Beautiful Trouble – is partnering with The Hammer Museum here in Los Angeles for a FREE 3-hour workshop at The Wiltern Theater on April 9th with Reverand James Lawson, and BT Training Director Nadine Bloch. In three hours, you will be introduced to new tactics and principles for action organizing and gain new insights for building capacity for your group. PLUS you will be in a room with HUNDREDS of activists and advocates for progressive causes here in Los Angeles – just think of the networking possibilities! We want activist organizations like YOU to come out and table at no charge – meaning you can use this space for education and outreach on the issues you care most about. You will have a table provided – you just need materials and someone to manage your table. There will be time before and after the workshop available to you. We hope this will provide greater incentive for you to join us for this stellar workshop! Looking forward to seeing you on April 9th! For more information contact Chelsea at Beautiful Trouble.